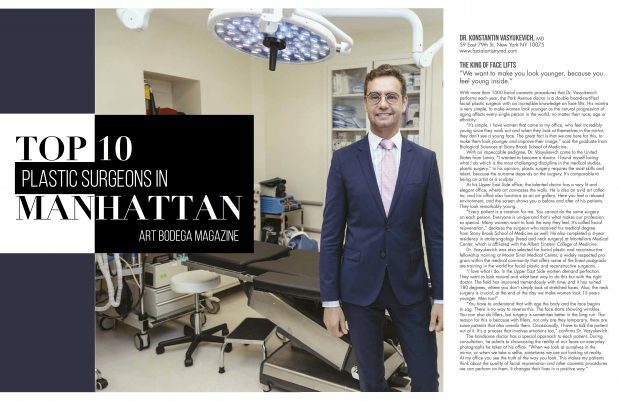 Dr. Konstantin is named top plastic surgeon in Manhattan by Art Bodega Magazine. With more than 1,000 facial cosmetic procedures performed each year, Dr. Konstantin Vasyukevich has an incomparable knowledge of face-lifts, and is a respected and sought-after surgeon noted for his expertise. The renowned Park Avenue doctor is a double board-certified facial plastic surgeon who has a degree from the Stony Brook School of Medicine. His mantra is very simple: to make women look younger as the natural progression of aging affects every single person in the world, no matter their race, age or ethnicity. With an impeccable educational pedigree, Dr. Vasyukevichoriginally came to the United States from Latvia. “I wanted to become a doctor,” he said. “I found myself loving what I do. Plastic surgery is the most challenging discipline in the medical studies.” He feels that plastic surgery requires the most skills and talent because the outcome depends on the surgery. It is comparable to being an artist or a sculptor. The relaxed feeling of his Upper East Side office is felt with the first steps taken inside. The elegance is apparent as the walls are adorned with fine artwork. Dr. Vasyukevich not only is a talented doctor but he also is an avid art collector, which is why his office also functions as an art gallery. Digital side-by-side screens in the waiting area show before and after images of the doctor’s patients, whereby those in the after photos look remarkably young. This bright young surgeon received his medical degree from Stony Brook School of Medicine. Additionally, he completed a 4-year residency in otolaryngology – head and neck surgery at Montefiore Medical Center, which is affiliated with the Albert Einstein College of Medicine. Dr. Vasyukevich also was selected for facial plastic and reconstructive fellowship training at Mount Sinai Medical Center, a widely respected program within the medical community that offers some of the finest postgraduate training in the world for facial plastic and reconstructive surgeons. And it is all done so that patients come out feeling younger and better in every aspect of their life.